(Nanowerk News) Glass fibres can do more than transport data. A special type of glass fibre can also be used as a high-precision multi-purpose sensor, as researchers at the Max Planck Institute for the Science of Light (MPL) in Erlangen have now demonstrated ("Flying particle sensors in hollow-core photonic crystal fibre"). The MPL researchers sent a tiny glass bead which can literally sense different physical quantities such as electric field, temperature or vibrations through the inside of this hollow-core photonic crystal fibre. The flying particle detects the quantities to be measured over long distances with a high spatial resolution, even under harsh conditions like those in an aggressive chemical substance or inside an oil pipeline. Measured in flight: Researchers at the Max Planck Institute for the Science of Light use a microbead which flies through the hollow channel in the interior of a photonic crystal fibre to measure different physical quantities, for example the electric field along the optical fibre. The spatial resolution here is so high that the researchers can still accurately reproduce the configuration and size of electrodes, represented by copper-coloured plates above and below the fibre, when they are only 200 micrometres wide. “In the beginning, the idea was to develop a radioactivity sensor for inside a nuclear power station,” says Tijmen Euser from the Max Planck Institute in Erlangen. Similar tasks are often undertaken using glass fibres with embedded fibre-optic sensors. What is measured is how the light sent through the fibre is affected by an external factor. 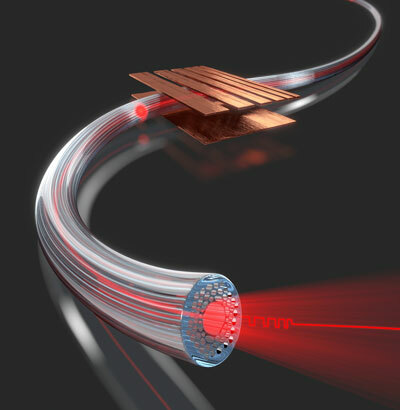 Such a fibre-optic sensor can also be used to measure a physical quantity remotely. By wrapping the fibre around the reactor, fibre-optic sensors could probe the entire surface of a reactor. It turns out, however, that radioactive radiation darkens the interior of conventional glass fibres so that light can no longer propagate therein, making them unsuitable to measure radioactivity. The glass fibres which we owe particular thanks to for high rates of data transmission, and thus a fast Internet, have an inner channel made of glass with a high refractive index, surrounded by a cladding of glass with a low refractive index. The difference in refractive index ensures that the light beam is reflected at the interface to the cladding. It thus remains trapped in the core like water in a pipe and follows the glass fibre, even if it is curved. In photonic crystal fibres (PCFs), which were invented around 20 years ago by Philip Russell, Director at the Max Planck Institute for the Science of Light, the inner channel is in contrast hollow and usually filled with air. The hollow channel is surrounded by further hollow channels that run along its entire length. The diameter of these channels is only a few times the wavelength of light, which means that the channels affect the propagation of the light. More precisely, they trap light in the inner channel – similar to the different types of glass in conventional optical fibres. The special properties of photonic crystal fibre, however, enable several applications that are not possible with conventional optical fibres. The fact that the fibres have a hollow core was a crucial aspect for the team. As the air-filled cavity cannot be darkened by radioactive radiation, the researchers see PCFs as an interesting alternative to conventional fibre-optic sensors in order to ultimately measure radioactivity as well. The Erlangen-based physicists examined whether hollow-core photonic crystal fibres are suitable as sensors by initially using the fibres to measure electric fields, vibrations and temperatures. To this effect, they used a tiny glass bead as the measuring probe and guided it through the thin, hollow channel of the crystal fibre only a few thousands of a millimetre across. This was achieved by sending a laser beam through the channel from each end of the fibre. The tiny bead reflects the light like a small mirror and thereby experiences pressure from both sides which is generated by the impacts of the light on the particle. By setting the power of the two laser beams to different strengths, the bead was pushed in one direction slightly more than in the other and moved through the fibre at a specific speed. Like the illumination unit of a flatbed scanner, the particle can now probe one parameter along the glass fibre at a time. To measure the strength of an electric field, the researchers in Erlangen exploited the fact that the bead becomes electrically charged by rubbing against other beads before they send it through the hollow fibre. In an electric field, it is therefore deflected from the centre of the channel to its edge, and thus reflects more laser light to the side than in the normal position. This light attenuation is measured by a photodiode at one end of the fibre. The loss here is proportional to the strength of the electric field, and it is thus possible to determine the field from a distance. To find out to what resolution the spatial distribution of the field strength can be measured with the flying bead, the researchers passed the glass fibre close to very fine electrodes, the thinnest measuring a mere 200 micrometers (one micrometre corresponds to one thousandth of a millimetre). The researchers actually succeeded in accurately reproducing the fine structure of the electrodes with their fibre-optic measuring instrument. “We were also able to measure magnetic fields with a magnetic bead with extremely high precision,” says Dmitry Bykov, doctoral student at the Max Planck Institute in Erlangen and lead author of the study. Vibrations could also be similarly determined, as they also deflect the particle from the centre of the fibre. Electric fields and vibrations can be distinguished by the behaviour of beads carrying different levels of charge. Bykov and his colleagues have also demonstrated that their PCF can measure the temperature. For this, they use the fact that the viscosity of air decreases with increasing temperature, and the particle thus migrates faster through the channel of the fibre. To measure its speed, the physicists illuminate the bead with an additional, weak laser. They use the Doppler effect here, which is familiar from passing cars. Their sound has a higher pitch when they are approaching than when they are moving away. Wavelengths of the light behave in a similar way to the wavelength of the sound waves when emitted by moving objects. In their experiment, the researchers used an oven to heat part of the fibre to temperatures of several hundred degrees Celsius. They were able to measure this temperature with an accuracy of around five degrees. Fluctuations in the speed meant the spatial accuracy of this method was only a few centimetres. “With the aid of a rotating particle, whose rotational frequency depends on the viscosity of the air, it would be possible to measure with micrometre accuracy, however,” explains Euser. “Next, we want to realize the radioactivity sensor,” says Bykov. To do this, the researchers want to use fluorescent beads, which re-emit the radioactive radiation absorbed in the form of visible light. Information on the strength of the radioactivity at the location of the bead would then be provided by the changes in the intensity of the fluorescence. Bykov sees great potential in the new technology. The spatial resolution would theoretically be limited only by the size of the particle. Nanoparticles would then make it possible to measure with nanometre accuracy, i.e. on the scale of viruses. The maximum length of the sensor fibre is currently around 400 metres, as the laser light experiences losses as it is transmitted in the PCF, and thus the glass bead can no longer be trapped above a certain length. However, PCFs with significantly lower losses also exist. These could be used to increase the range of the fibre sensors to several tens of kilometres. Tijmen Euser therefore foresees many further fields of application, particularly when measurements have to be carried out under harsh conditions and over large distances. “One example for possible applications are oil pipelines,” says the physicist. Measurements of vibrations could uncover damage caused by sabotage, for example, at an early stage. The sensors could also be useful along high voltage lines or in transformer substations. Electric fields, vibrations and temperatures, and thus three quantities that are relevant in these installations, could be recorded with a single measuring instrument.